It's back to school time again, and you know what that means. Time to empty your pockets to buy the semester's books. Here are a few tips to help you save some of that hard earned money. International editions saved me a bunch of cash in college. They're essentially the same thing you would buy in the textbook store, just with a soft cover and for half the price. The whole legality and reasoning behind why publishers create International Edition is grey and peculiar to say the least. But if you're willing to put all that aside in order to save some big bucks (as I did), try looking for them on sale at sites like Ebay (affiliate link) and AbeBooks.com(affiliate link). The internet marketplace has changed how we do business forever. Within seconds of turning on your computer, you can search the web for a variety of products at the lowest price possible. There are plenty of sites geared exclusively to help you finding the best deals on college text books, like DirectTextbook.com. The old standby, Amazon, is always a great option as well. **Warning** When buying books online, carefully examine the seller's description and pictures of the textbooks they are selling. You don't want to end up with a Xerox'd black & white copy of your book held together with some staples and glue. A lot of book stores offer a buy-back credit. Meaning if you sell back your old books to them, they will give you a store credit greater than their normal cash pay-out in order to keep your business next semester. I have a friend that does this every semester and he only spends a fraction of what everyone else does on books. When I think textbook rental, I think Chegg.com. At Chegg you can rent a textbook for a semester at around half of what it would cost to buy it, and simply send it back when the semester is over. This method keeps you from being stuck with a book that stores won't buy back because a new edition is coming out. However, when searching for reviews of the site, I came across a lot of mixed opinions. Personally, I have never done business with them so I have no opinion on the matter; I am just reporting what I have read on the internet (which should always be taken with a grain of salt, to say the least). 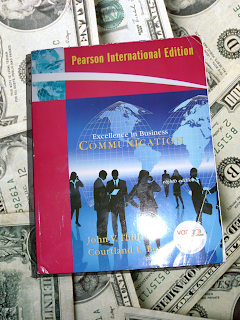 Want to cut the price of a textbook in half? Make friends with someone in your class and share a book. The main problem with this is that obviously only one of you can have the book at a time. The only way around this would be that one person make a copy of pages they need. And when it's time to sell the book back, you can just split the refund in half.